Miguel Palma is recognised as one of the most significant artists living in Portugal today and has played a key role in the developing profile of contemporary Portuguese art. His work examines ideas about value, transaction, risk and technology. A particular focus is the automotive industry. He has built cars and raced them and developed prototypes such as a solar powered car and a VW combi that has a transparent lung on its back into which all the exhaust fumes pour. 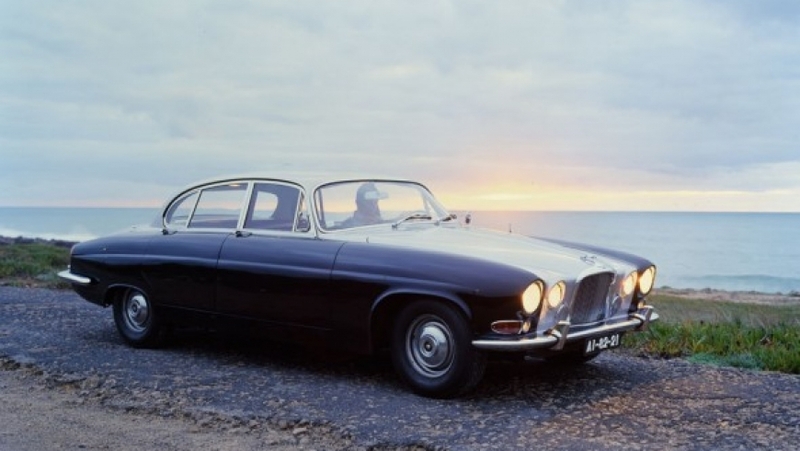 In 2009 he acquired a Jaguar Mark X which bears the legend, ‘Jaguar Ltd, Coventry, England’. It had been made in this city in 1963 for export and was sold in Paris to a chocolate manufacturer. It was later bought by a Dutch doctor and taken to Lisbon. Looking through the archives at the Jaguar Daimler Heritage Centre, Palma found publicity shots featuring the new car by the Discoveries Monument, installed in Lisbon in 1960. With such a strong Lisbon – Coventry link, he decided to bring the car back to Coventry in an epic journey that would be filmed. To support this project, Palma developed another project, featuring the car, which he called ‘Private View’. He placed an advertisement in the European art press, offering twelve drawings to different collectors who would be prepared to come to Lisbon, have a tour in the Jaguar, a lunch and choose their drawing, all in front of the camera. The twelve separate films explore the private relationships between artist, artwork and collector and open the process of collecting art to the scrutiny of the gallery visitor. Palma also made 47 drawings, one for each year of the car’s life, using images from the Jaguar Daimler Heritage Archive. Hung “salon style” in the Mead, they resemble pages from a photograph album or scrapbook. Some are annotated to convey the car’s own fantasies about its role, in images which are already constructed to create an image of allure and sophistication for the car. There is a Portuguese word “saudade” which describes a feeling of nostalgic longing for something or someone that was once loved and which is lost. It often carries a fatalist tone and a repressed knowledge that the object of longing might really never return. This exhibition is imbued with nostalgia for not only a particular car, but for a period in the history of Coventry. And of course, the car has broken down and its return journey has, with poetic irony, been halted. There is no going back.